Ready to surprise your child with a personalized Nice List Certificate from Santa? Order today and your letter package will be mailed by December 1! Not sure what your child wants? Download our FREE Christmas Wish List template! Every child knows the old Christmas carol by heart, but not every child knows that they’re on Santa’s “Nice List”. This beautiful certificate will let them know that Santa’s been watching them—and that their good behavior has not gone unnoticed! Move your mouse over the Nice List Certificate sample image to highlight personalization field sample text. Are you ready to put your child on Santa’s Nice List? 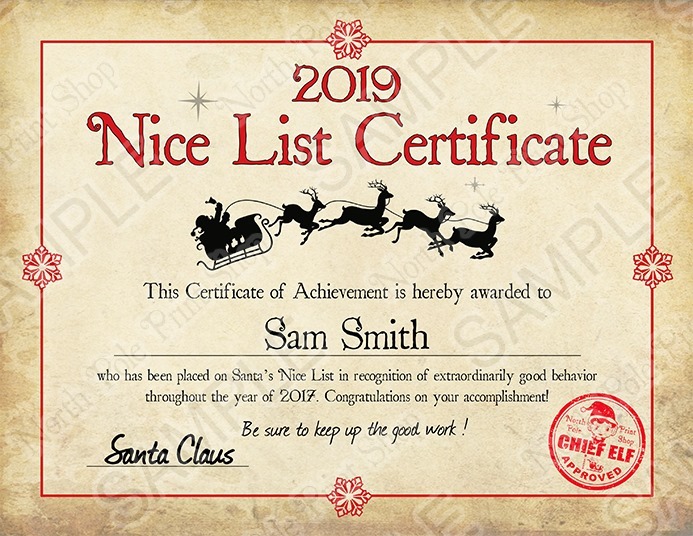 Order your Nice List Certificate from Santa today! Letters & packages are mailed daily beginning December 1. Email a link to the Written By Santa website and Order Now page to a friend by entering their information below and clicking the submit button.